The H0804DVR-5MP DVR takes video recording resolution to 5 megapixels for ultra clear images and improved identification. Backward compatibility means you can use your existing analog cameras as well as the new 5MP HD-TVI and AHD or CVI high definition cameras. 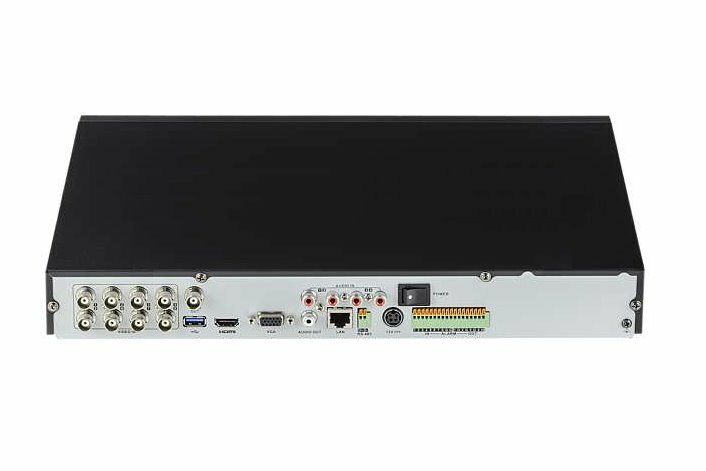 The HD recorder can support HD-TVI cameras up tp 5MP resolution as well as 2MP AHD or CVI cameras and will automatically detect the type of camera making it easy to mix and match any combination of HD or analog cameras. HD-TVI 5MP cameras provide far greater detail and clarity when compared with standard analog cameras making identification more reliable. Live viewing, full configuration, recording and playback is available locally or over the Internet by computer using Internet Explorer or the CMS (Central Management Software). View and configure up to 64 cameras from multiple device locations with our CMS software. Smart phones and other mobile devices are also supported allowing for live viewing, playback, recording and limited configuration using the Guarding Vision app. Searching and playback can be done by time and date, all day, alarm, motion or smart playback. Backup is easy using a USB flash drive or USB hard drive. The H0804DVR-5MP also supports Cloud Storage so your videos can be safely backed up to services such as One Drive, Google Drive or Drop Box protecting your evidence even if someone steals or destroys your DVR.